147 Pennsylvania, Lieut. Col. Ario Pardee, Jr. The 5th Ohio and 147th Penn. 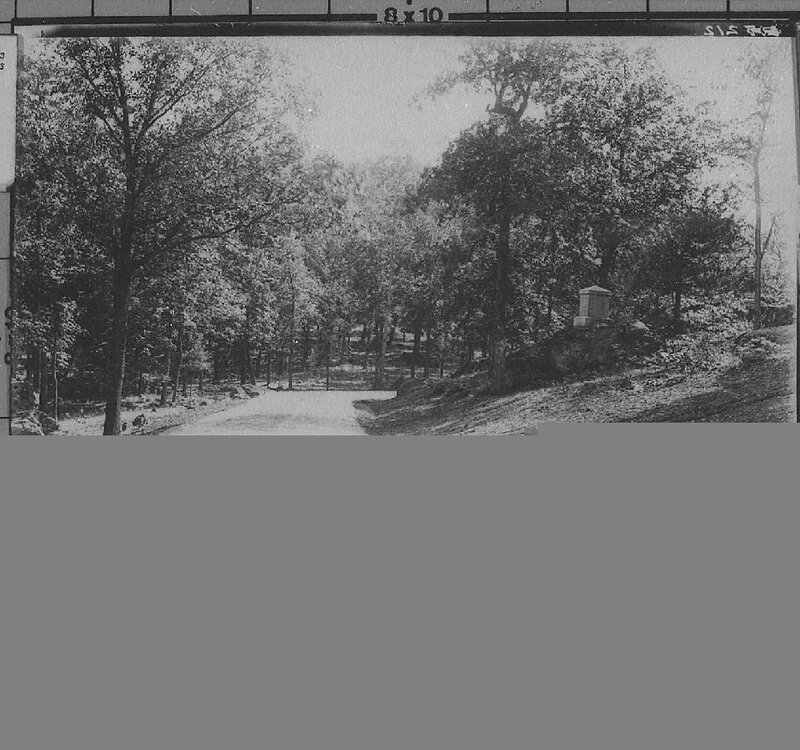 were stationed on Little Round Top at 5 p.m. and remained throughout the night of July 1. They were removed at 5 a.m. on July 2 and ordered to the Union right. Holland's signal station operated on Little Round Top during the evening of July 1 and left at 5 a.m. on July 2 with the 5th Ohio and 147th Penn. Jerome operated a signal station on Little Round Top supporting Brig.Gen. Buford from about 8 a.m. until about 12 p.m.
Hall supported the 2nd Corps with a signal station on Little Round Top from about 1 p.m. until 5 p.m.
Warren arrived at the signal station on Little Round Top sometime shortly before 3:30 p.m. He was accompanied by Chauncey B. Reese, Randal S. Mackenzie, and Washington Roebling. Vincent detached his brigade and sent it to Little Round Top at about 4:30 p.m. It was hit by the Confederates at about 4:45 p.m. Command of the brigade devolved to Rice when Vincent was killed at about 5:45. 20th Maine, Col. Joshua L. Chamberlain. The 16th Michigan was allowed to pass the 44th New York so that the 44th and the 83rd Pennsylvania ("Butterfield Twins") could fight together. Chamberlain wrote that his regiment was the first up the hill. Oliver Norton, Vincent's flag bearer, wrote that the 20th Maine was last. If the 20th Maine was indeed first, all of the other regiments must have passed them to go to the right. This order reflects Norton's version. The center of Vincent's Brigade was hit at about 4:45 p.m. The extreme right, defended by the 16th Michigan, was engaged at about 5:45 p.m. The 20th Maine became engaged on the left at approximately 6:00 p.m. O.O. Norton recalled that the fight against Vincent's Brigade ended sometime between 6:00 and 7:00 p.m. The left wing of Chamberlain's regiment was refused at about 6:15. Chamberlain ordered his charge at approximately 6:45 p.m. The Confederates had been swept from the front at about 7:00 p.m.
Morrill's company was placed about 150 yards to the left of the 20th Maine's line to screen the front and left. They remained there during the fight until the 15th Alabama began to retreat in front of Chamberlain's charge when Company B stood up from behind a stone wall and fired into the retreating Confederates. About a dozen men (led by a sergeant) of the 2nd U.S. Sharpshooters fell in with Company B, 20th Maine. Brady's Independent Company of Sharpshooters, 16th Michigan Brady's Sharpshooters were sent out as skirmishers with Company A, 16th Michigan. Hazlett and Martin came up the hill and conferred with Warren before Warren was aware that Vincent was on the other side of the hill. Hazlett left and came back with his battery. Rittenhouse replaced Hazlett when Hazlett was killed trying to comfort Weed who was mortally wounded. The 140th New York was last in column as Weed's Brigade was being marched toward the Emmitsburg Road. Warren acquired O'Rorke's regiment and it became the first regiment of Weed's Brigade to ascend Little Round Top. Command of the brigade devolved upon Garrard when Weed was mortally wounded. Jenkins replaced Garrard as commander of the 146th New York. Command of the 140th New York devolved upon Ernst when O'Rorke was killed. The 91st Pennsylvania went into position on the right of the 140th New York. The 146th New York and the 155th Pennsylvania continued the line toward the northern crest of the hill. Gibbs' battery went into position to the right of Hazlett's on the northern slope of the hill. The guns were unlimbered and moved among the boulders by hand. 11th Pennsylvania Reserves, Col. Samuel M. Jackson. Upon instructions from Maj. Gen. Sykes, Crawford formed McCandless' brigade, along with the 98th Pennsylvania from the 6th Corps and the 11th Pennsylvania from the 3rd Brigade, on the northern shoulder of Little Round Top to the right of Vincent's Brigade. After waiting about 20 minutes, they attacked down Little Round Top against elements of Anderson, Semmes and Kershaw's brigades. The attack commenced after Vincent's fight was over and continued until dark (8:25 p.m.) when they had swept the Confederates from the Plum Run Valley and past a stone wall on the east side of the Wheatfield. Fisher's brigade formed on Little Round Top behind Vincent's brigade and served to secure the position after the Confederates had been repulsed. Pierce established his signal station shortly after 5 p.m. in the same location which Hall had abandoned as "impracticable". Johnson was sent by Lee to reconnoiter the enemy's left early on the morning of the July 2. According to Johnson, he climbed Little Round Top as a part of his reconnaissance at about 5:30 a.m. If so, it must have been right after Geary's two regiments left and before Lieut. Jerome climbed the hill to use it as a signal station. The initial attack is by the 4th Alabama and the 4th and 5th Texas. They attacked twice and were repulsed twice. Command of the 5th Texas devolved upon Rogers when both Powell and Bryan are wounded. Command of the division devolved upon Law after Hood was wounded. Vincent's brigade is attacked a third time by elements of Robertson's and Law's brigades. The 48th Alabama had joined the fight on the left of the 4th Texas. The 48th Alabama and the 4th Texas continue to attack Vincent's right. The 16th Michigan begins to fall back pressed by the 4th Texas and the 48th Alabama. 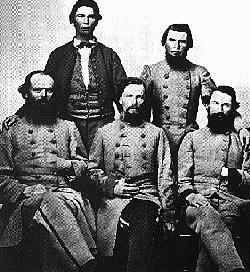 The 15th Alabama started the movement forward as the center of the battle line. Law moved the two end regiments across the rear of the 15th to assist Robertson's attack on Devil's Den. the 15th and 47th Alabama climbed Big Round Top and then moved down hill toward Vincent's line on Little round Top, both regiments under the control of Oates. The 15th Alabama attacked the 20th Maine. The 47th Alabama attacks Vincent's line against the 83rd Pennsylvania and the right of Chamberlain's line. The 140th New York repulsed the attack on the far right of Vincent's line and the 20th Maine repulsed the 15th Alabama on the left. Command of the 47th Alabama devolved upon Campbell when Bulger is captured. (-) Indicates less than the full organization.